Captain America, Thor, and Iron Man brought in one of the biggest openings in movie history. Disney and Marvel Studios' "Avengers: Age of Ultron" smashed the box office this weekend, but missed breaking the record for largest opening. The comic book film's opening weekend pulled in $191.3 million, the second biggest in box office history. 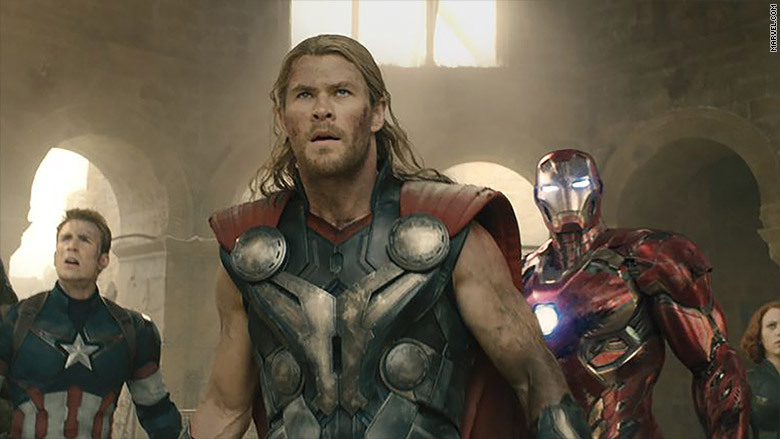 This number came up short of the series' first film, "The Avengers," which opened to a record $207.4 million in 2012. "Ultron" has made $631.1 million worldwide in just 12 days. The opening falls well short of industry projections, as some analysts were predicting an opening as high as $220 million just last week. "Built into the Marvel DNA is that perfect combination of marketing and release strategy along with great content," said Paul Dergarabedian, a box office analyst for Rentrak (RENT). The Marvel Cinematic Universe -- the interconnected films of the series -- has been one of the most successful brands in movie history, making over $7.5 billion worldwide. Disney (DIS) is hoping that more big box offices are on the way, as the company has multiple Marvel films planned for the future. This includes next summer's "Captain America: Civil War" and a standalone Spider-Man film in 2017. The studio has also set the dates for the third film in the "Avengers" series, "Avengers: Infinity War," which will be broken into two parts in 2018 and 2019. The $191.3 million opening for "Ultron" paired with the $147 million opening for April's "Furious 7" also means that the film industry is having a reversal of fortunes from last year. The summer of 2014 was one of the most dismal in recent history for Hollywood. Meanwhile, Marvel's parent company, Disney, has a big slate of box office favorites planned for the rest of 2015. This includes the return of Pixar with the animated "Inside Out" in June and another Marvel film "Ant Man" in July. Then the Mouse House looks to take audiences to a galaxy far, far away with the seventh film in the "Star Wars" saga, "The Force Awakens," in December. This is a film that many feel will be one of the biggest blockbusters of all time.